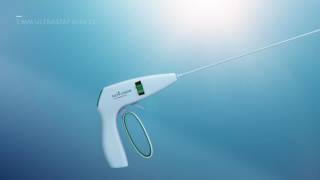 NOVUSON SURGICAL's UltraSTAT surgical instrument platform is designed for minimally invasive surgery, Vessel Sealing, Gynecology, Urology, Trauma, and other surgical specialties. Founded in 2014 by University of Washington Applied Physics Lab researchers, Novuson holds 7 granted US patents, and has developed functional prototypes of the first product systems to be built on the Novuson platform. Use of Novuson systems will deliver significant improvements to patient outcomes and hospital costs. Over 85 Swine Trials of the technology have confirmed superior performance. The company is now seeking investment funding to complete product development and FDA 510(k) clearance. Novuson’s patented DTU technology represents the first substantive innovation in over 25 years for targeting vessel sealing / dividing, soft tissue ablation / hemostasis (bleeding control) in surgical and trauma applications. Existing solutions rely on transmission of electrical currents through the patient and are severely limited in speed, precision, and range of application. The Novuson DTU technology has been shown to rapidly and precisely ablate soft tissue from delicate, vital structures to 50mm thick organ cross-sections. These treatments are accomplished without collateral tissue damage and without electrical current in the patient. This level of performance is unprecedented and disruptive to its market. Beyond the initial product systems, the platform will enable multiple products for a broad range of additional applications. The 2019 global TAM in this segment is projected to be over $8.8B USD. Year 5 of sales annual gross revenue of system plus disposables sales conservatively estimated at over $49M and more than 80% gross margin. 1) Adaptive control console (our “Razor”). Hospital Capital Equipment. 2) “Plug and Play” Handsets (our “Razor Blades”). Single patient episode disposable. Control Unit (CU) @ $21K EUP, $1,000 COGs. Applicator Units (AU) @ $500 - $1,200 EUP, $135 COGs. Over 20 years’ experience in biomedical instrumentation, 10 years in acoustic device and 15 years in tissue response to stimuli. Inventor of Novuson’s technology, conceptualized the market space, and developed the business strategy. Managed million dollar corporations/projects for 30 years. Started ACCES with Jean Maixner, grew to a multi-location practice with 70% CAGR, successful exit via merger with nationwide company, 7000% ROI. PI of 3 awarded NIH small business grants totaling 3.25M in Non-Dilutive Funding for Novuson. With 22 years in healthcare, Marco’s work in innovation crosses multidisciplinary areas from technology, to services, program & product management, commercialization & marketing. He holds several health-tech patents, and has launched numerous successful life sciences products, where he optimizes development & commercialization strategies to improve patient outcomes, simplify provider workflows, and reduce provider/payor costs & waste. Novuson is proud to announce and welcome Derek Khorsand, M.D. as the company’s Chief Medical Officer. Dr. Khorsand will be responsible for leading clinical outreach, reviewing our technology value proposition and providing feedback on technical usability. Dr. Khorsand is currently a Resident Physician of Interventional Radiology at the University of Washington Medical Center. He completed his Internship in General Surgery at Virginia Mason Medical Center. Dr. Khorsand received his Doctor of Medicine from the University of Washington School of Medicine and his Bachelor of Science in Biochemistry from the University of Washington. Shane Cerrato has 18+ years of experience in global commercial development, business development, strategic marketing and sales management in the life sciences. His career has encompassed the planning and management of successful launches of niche products within medical devices and biotechnology and the global commercial development of products for an array of large markets, including: neurology, ophthalmology, cardiology and obesity products within the pharmaceutical, biotechnology and medical device industries. He has held progressive leadership positions at Solva Holdings, Bausch + Lomb, Allergan, Valeant Pharmaceuticals, Serono Biotech, Salu and Pfizer Pharmaceuticals. He holds an MBA from the University of Phoenix and a BA from Colorado State University. He served in the United States Marine Corps with multiple combat deployments in Desert Shield and Desert Storm, and was also an elite triathlete competing in Ironman distances including the World Championship in Hawaii.